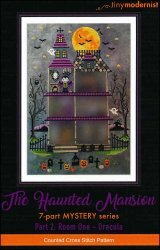 The Haunted Mansion Part 2: Room One - Dracula [H1759] - $2.00 : Yarn Tree, Your wholesale source for cross stitch supplies. Cross stitch pattern from Tiny Modernist. Look who just appeared in room one of the haunted mansion! It's Dracula! The bats are flying in the night sky decorated by the bright stars & orange moon. The ghosts are whispering in the trees. Who do you think will appear in room 2 of the haunted mansion? This is part 2 of the 7 part Mystery series. Stitch count is 156w x 224h for the full design.